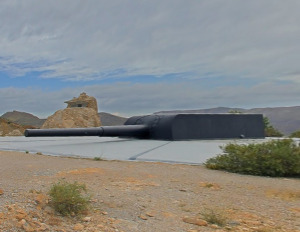 The Battery of Castillitos or Guns of Mazarrón, is a Spanish fortification of support of coastal artillery located in Cabo Tiñoso, just inside the municipal term of Cartagena in the Murcia region. 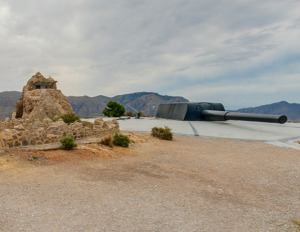 The Battery of Castillitos or Guns of Mazarrón, is a Spanish fortification of coastal artillery located in Cabo Tiñoso, just inside the municipal of Cartagena in the Murcia region. The guns were built and then manned between 1933 and 1936 and were endowed with two coast guns from the British armor company Vickers-Armstrongs. The two model 38,1 / 45 cm (fifteen inch) guns are very impressive to stand in front of. The views are truly breath taking from every angle up here. These heavy duty pieces had enough fire power to project a 1 ton round as far as 35 kilometers. The Guns of Mazarrón are located at a height of 250 meters. The design imitates a medieval castle, a common style for the time with influences of eclecticism and modernism. The clever architecture of the battery helps hide it within the mountainous landscape. The outside walls were built to imitate the texture of the rock face and prevent its view from afar. Once inside the complex, each piece of artillery has an engine room, gunpowder stores, spare parts, cistern and cargo chamber. The Guns of Mazarrón is open to the public and is a popular destination for many adventurous travellers.